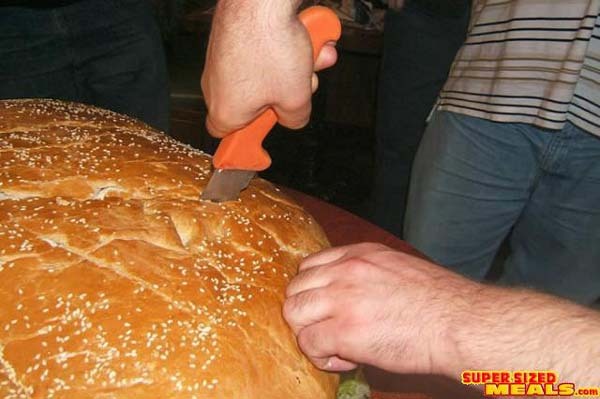 And the burger wars continue! 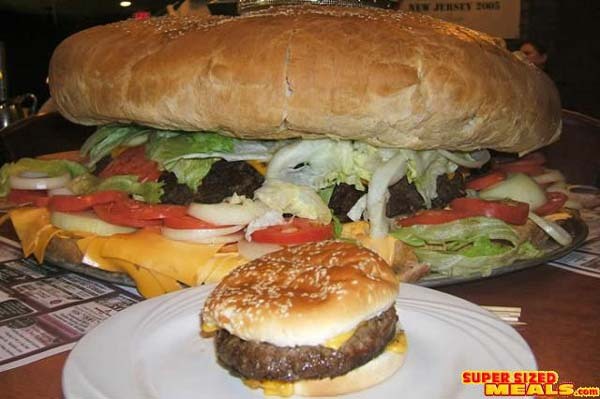 Clinton Station Diner has now made claim to the World's Largest commercially available hamburger, "The 8th Wonder". This 28" wide, 11.5" thick, 105 pound monstrosity was created today at the Clinton Station Diner in Clinton, NJ. 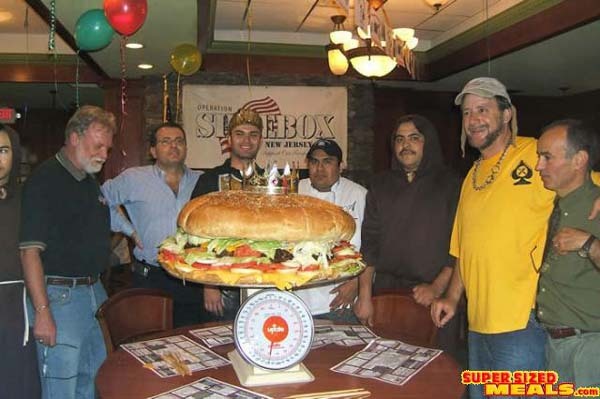 With previous massive burgers like the 7lb Zeus burger, and the 50lb Mt Olympus under their belts, it was no surprise that Clinton Station was secretly devising a way to beat the latest winner in the Big Burger Wars, the 78.5lb entry from Bob's BBQ and Grill in Pattaya, Thailand. Looks like they've brought the title back to the USA! 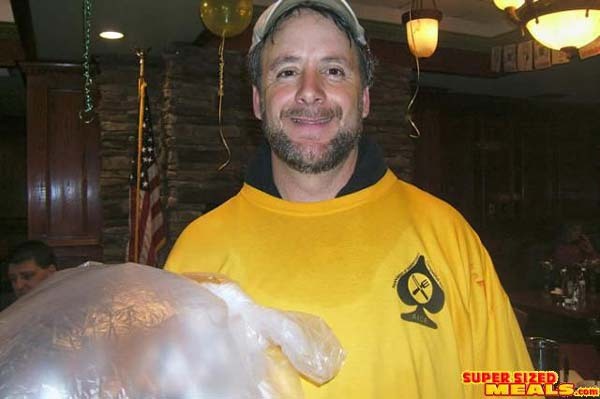 10/29/06 - OMG! 105 Pounds! ARE YOU KIDDING ME?? 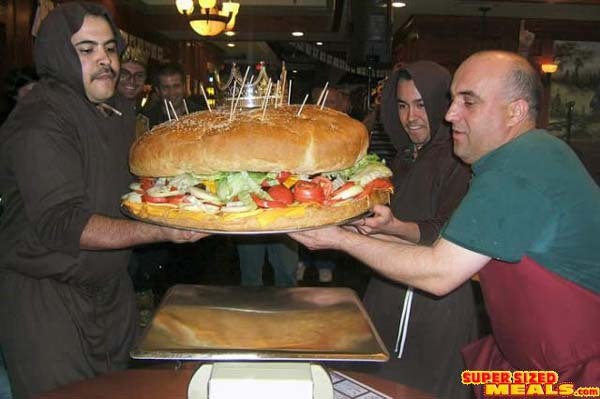 History was made at the Clinton Station Diner yesterday by setting the new World Record for the Biggest Menu Hamburger in the world appropriately dubbed "The 8th Wonder" (interestingly enough this is also the 8th type of burger offered at Clinton Station Diner). 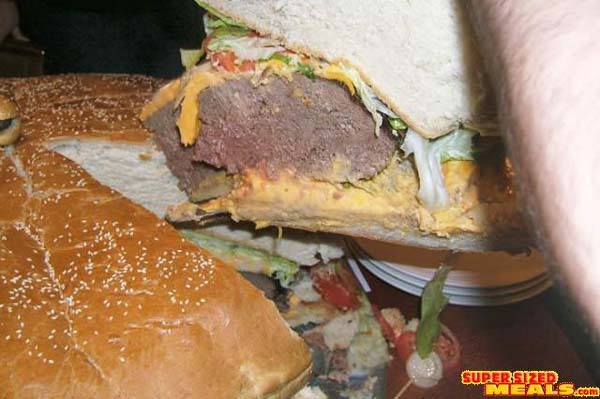 Mere words cannot express the totality and enormity of this massive meat monster. The dimensions on this bad boy measured out to be 28 inches in diameter and 11 1/2 in height and a whopping 105 pounds in total weight. 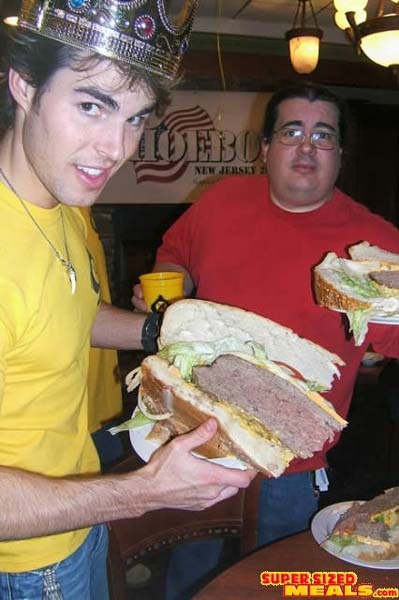 It has been reported that several competitive eaters broke down in tears of joy as they witnessed the unveiling of this World Record Burger. 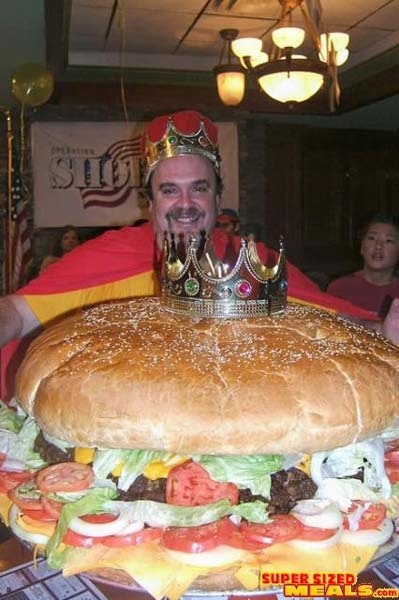 Owner Mike Zambus s will be submitting necessary documentation to Guinness Book of World Records to certify "The 8th Wonder" as the new World Heavy Weight Burger. 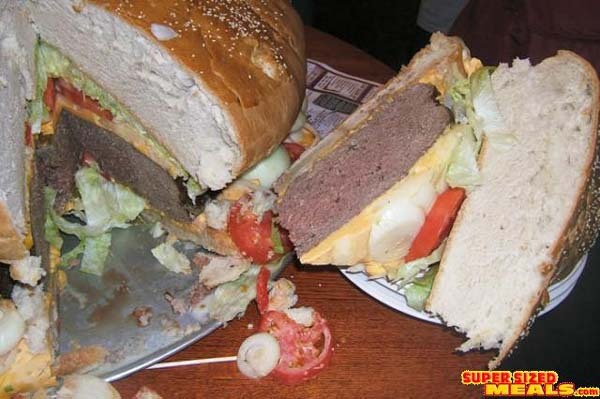 Unlike many previous World Record Burgers that were constructed, "The 8th Wonder" is a delicious creation and also maintains the fine tradition of the previous Zambus burgers. 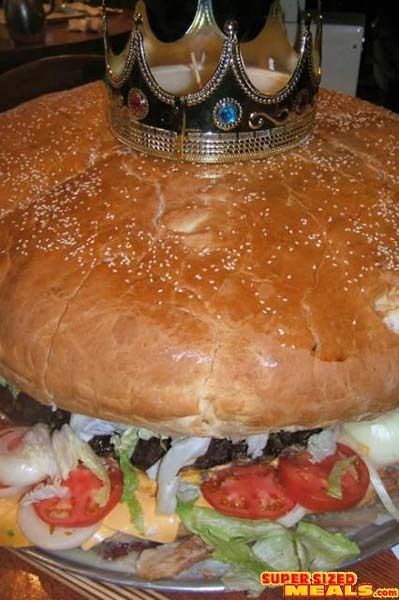 Customers had the delicious opportunity to sample this massive burger at the end of the presentation and all were in agreement of the high quality and great taste of The 8th Wonder. 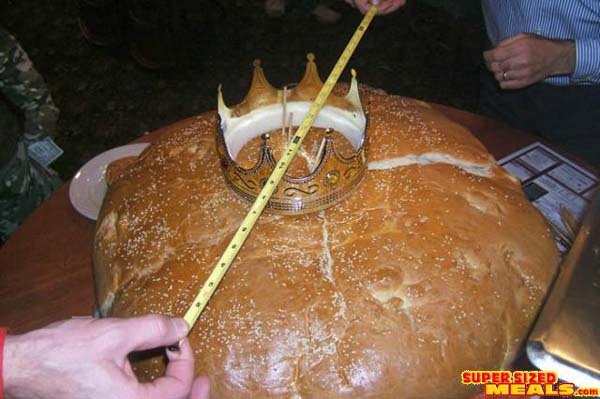 Some were lucky enough to take home a slice of this historic event (slices weighed in at 7 pounds-yummy snack!). 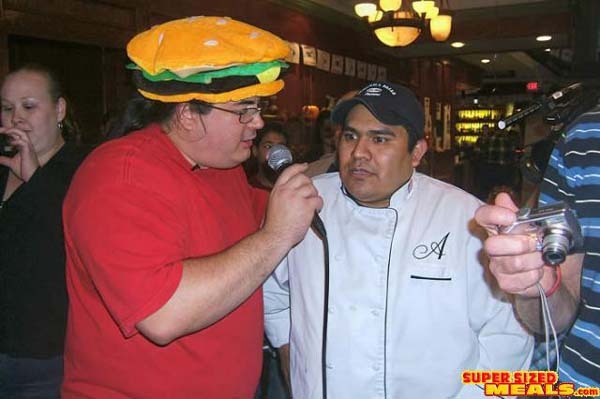 We were happy that the new Heavy Weight Burger title is back in America and that AICE was privileged to be part of this! 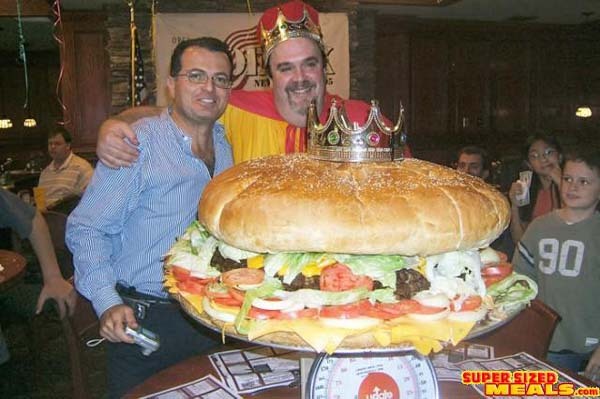 Not to take anything away from the great task that they have done but it looks to me that this one is just like there 50 lb Mt olympus burger, just packed with loads of toppings and doesn't seem to be porportionate in size to a regular burger which is why they never had the record before. It will be interesting to see the contents list and if Guinness will certify it. Bob's BBQ even though outside the US looks much more porportionate in size. 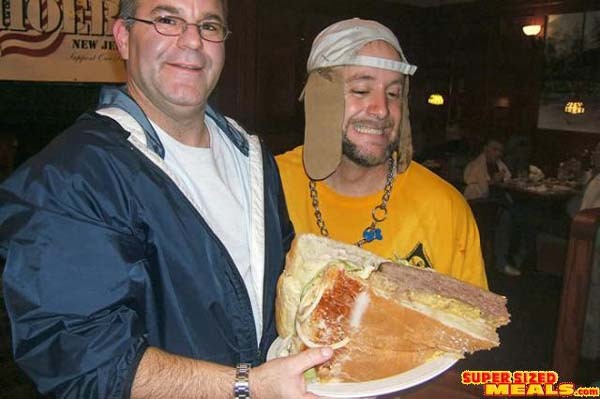 Will they respond to another bigger burger? 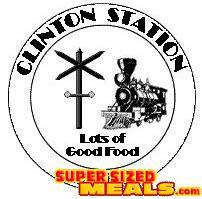 Well first I for one know how hard it is to make one of these so my first comment to Clinton Station Diner is Congratulations. I will post my honest opinion here just as I would in person. 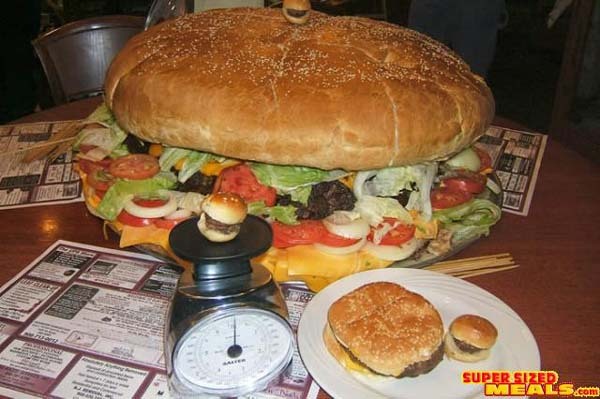 It is a big burger no doubt about that. Do I think it will make the World Record? Not a chance! The first thing I noticed was the meat is not fully cooked in the center and this is one of Guinness strict guidelines, There also has to be a certified Health official on premises to certify the fact that it was fully cooked and I saw no mention of this, The second biggest thing I see is there are just to many toppings and as already mentioned this is another strict guideline that it has to be in proportion to a normal burger. 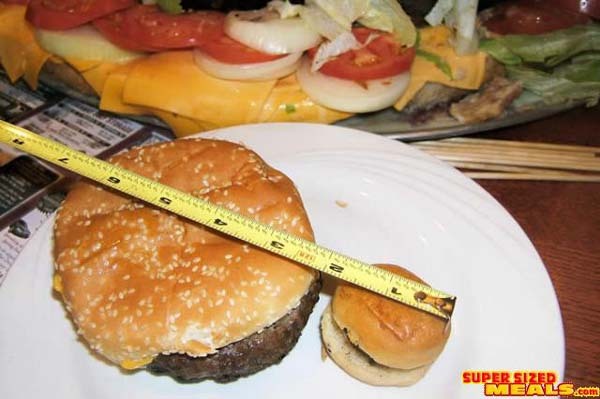 With all those toppings our Burger would have been over 105 lbs. 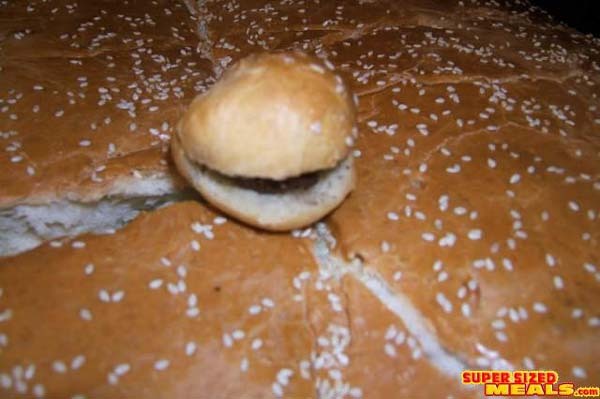 Lastly I see you experienced bottom bun problems from the photos and I can relate to them but we were able to resolve them. I wish you continued success. 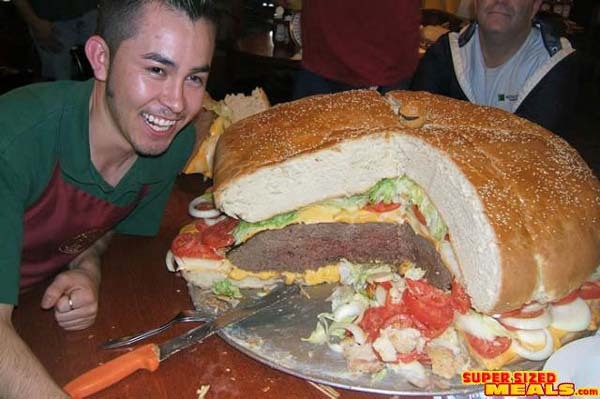 That is the biggest hamburger that I have ever seen in my life. 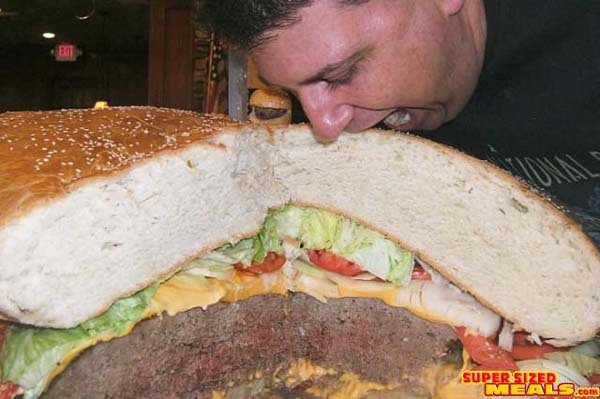 I don't see how any body could eat a hamburger so big. 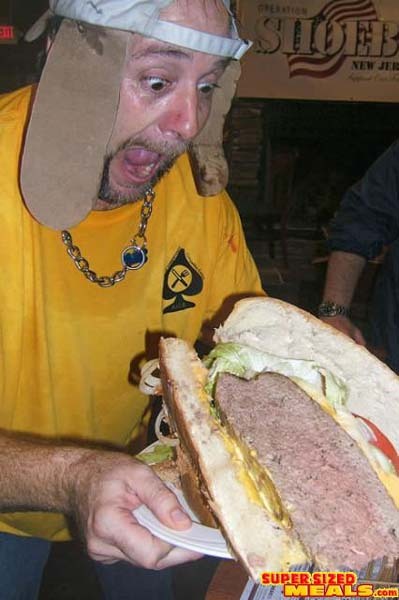 I don't even eat hamburgers. 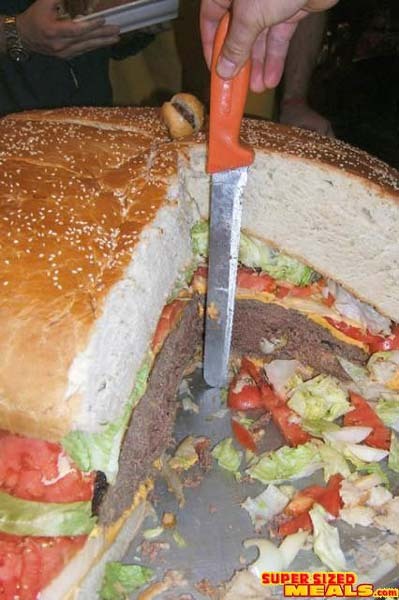 Well actually this isn't the World's Largest Hamburger anymore! 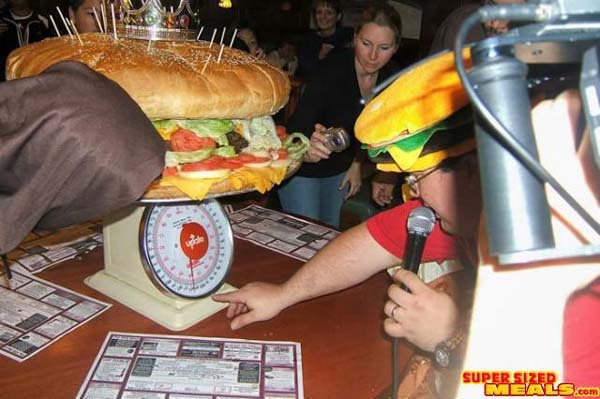 The title is currently held by Denny's Beer Barrel Pub's "The Main Event", a 123lb'er. You can see it Here, and a video of it here! .....and STILL only 99 Cents! 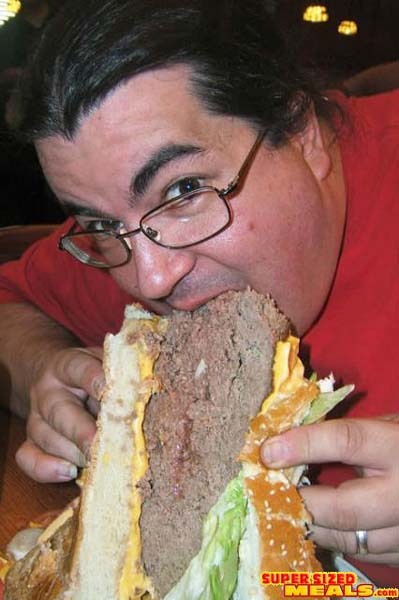 Gluttony isn't one of the seven deadly sins for nothing. This is a disgusting example of our inability to see what is really wrong with our country. Instead of spending the time and money to create this monster, they could have been donating both to a charity that feeds the hungry and/or homeless. Sad. Very sad. 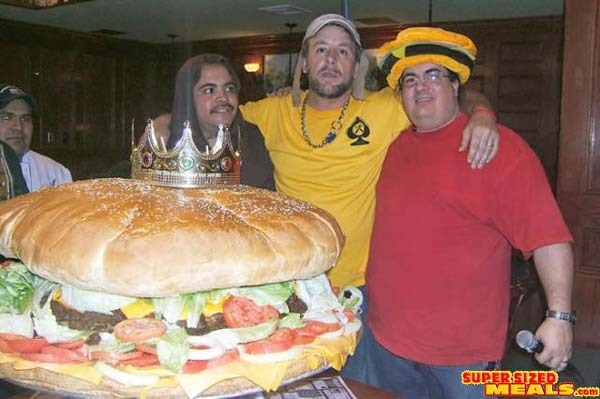 Lets just imagine if they spent the Iraq war chest on a burger!!! How big would that be!!! 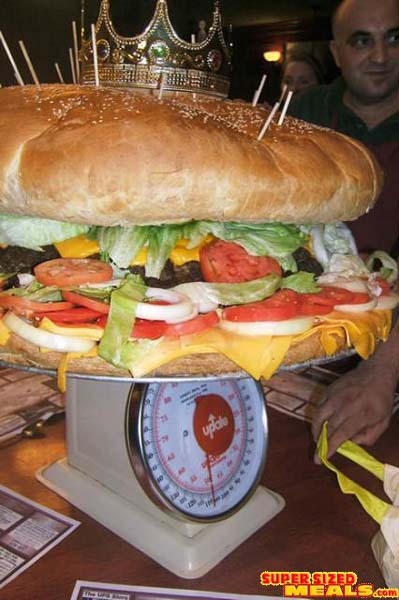 Japan always has some cool stuff, like the world's largest burger 136kg!